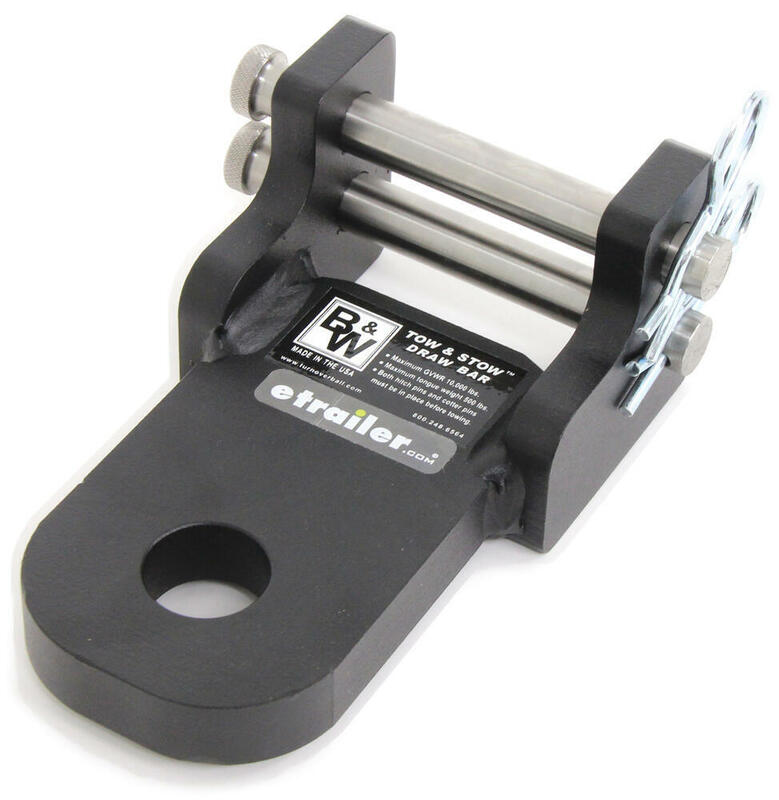 Attach this sturdy steel platform to your B&W Tow & Stow 2" ball mount so that you can tow your trailer that has a clevis. Hole diameter for clevis pin (sold separately) is 1-1/8". Stainless steel mounting hardware included. Call 800-298-8924 to order B and W accessories and parts part number BWTS35100B or order online at etrailer.com. Free expert support on all B and W products. Guaranteed Lowest Price and Fastest Shipping for Clevis Adapter for B&W Tow & Stow 2" Ball Mounts - 10,000 lbs. Accessories and Parts reviews from real customers. 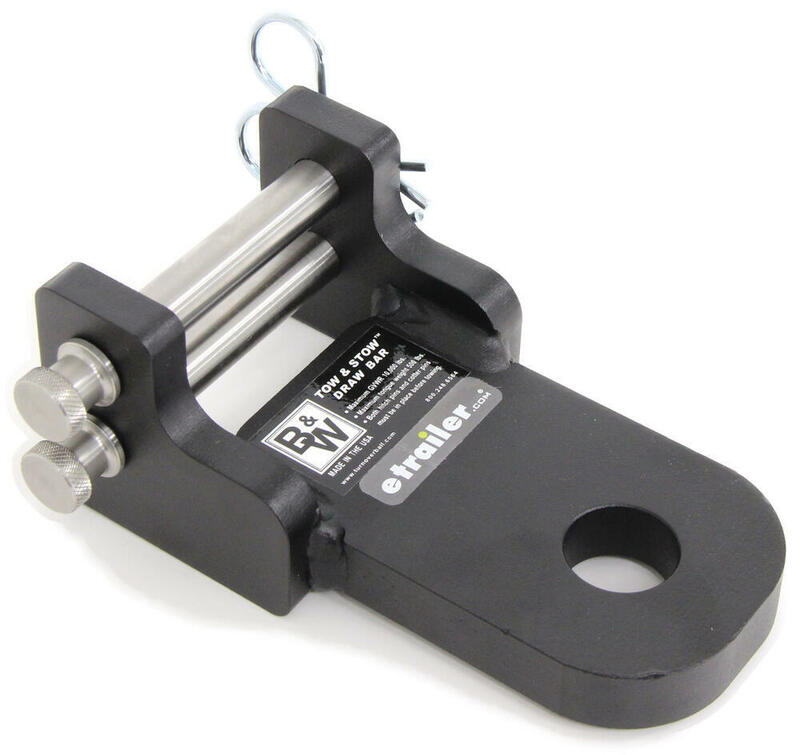 Ball mount platform thickness: 3/4"
Clevis pin hole diameter: 1-1/8"
Replacement Hitch Ball for B&W Tow & Stow Pintle Hook Combo - 2"
Today we're going to review part #BWTS35100B. 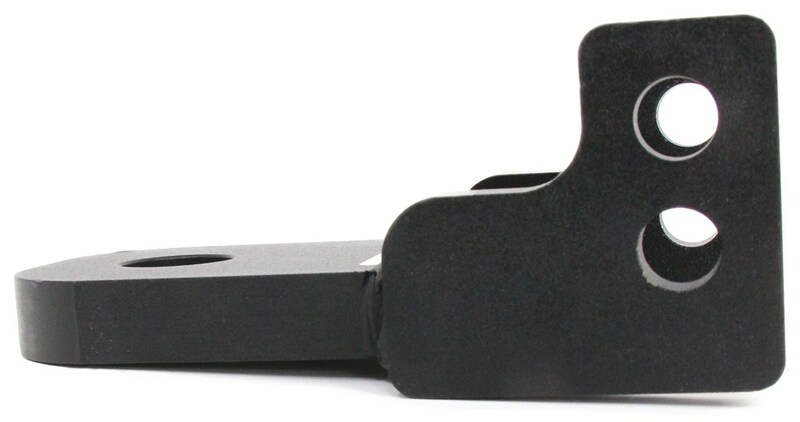 This is the B&W draw bar clank platform for BMW tow and stow ball mount. 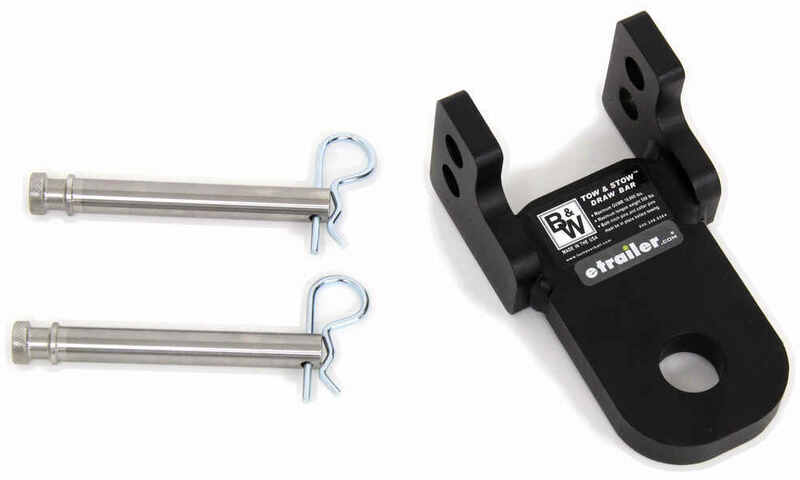 Now this draw bar attachment will mount to the shank of your B&W tow and stow multi-ball mount to supply a draw bar to use for a clevis and pin attachment. This adjustable design let's you match the height of your application. Basically this platform you could slide up and down on the shank and then secure with these included stainless steel pins and clips. It's made of a sturdy steel construction has a nice corrosion resistant powder coat finish on it and it is made in the USA. A few specs on this, the gross towing weight capacity is 10,000 lbs. The maximum tonne weight capacity is 500 lbs when it's used as a clevis and pin type coupling for towing. The whole diameter here on the draw bar is 1 1/4 in diameter. Now this is to be used with a B&W town and stow multi-ball mount only, and I happened to pull one here to give you an idea. We're going to show how it attaches to it, this one I pulled here is a #BWTS10048B. It is sold separately on our website and this is the B&W tow and stow 3 ball mount design. As you can see, I've already flipped it into the stow position, normally this would rotate out and have the ball out this way. When you go to install this draw bar platform you want to move it into the stow position which it is right now. Then what you'll do is go ahead and remove your clips off the draw bar platform, slide out your stainless steel pins, and then you'll see the two holes here and what you want to do is line that up with the adjustable holes right here on the shank, so you put it at whatever height you need for your application. Then take your pins, just find a position, there you go. Slide it in that way, once we get that first pin in, then you take your second one. Now you got both pins in there and then you go ahead and put your clips in there to hold it in position and you want to make that anytime you do use this, that both clips are used, not just one. You can see it gives you the draw bar platform. Then to remove it again just pull out the clips, slide out the pins, and then you can remove your draw bar platform. That should do it for the review on part #BWTS35100B, this is the B&W draw bar platform for B&W tow and stow ball mounts with a 10,000 lbs weight capacity. 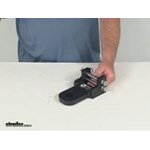 Order: RelevanceNewestRating - High to LowRating - Low to High Attach this sturdy steel platform to your B&W Tow & Stow 2" ball mount so that you can tow your trailer that has a clevis. Hole diameter for clevis pin (sold separately) is 1-1/8". Stainless steel mounting hardware included. 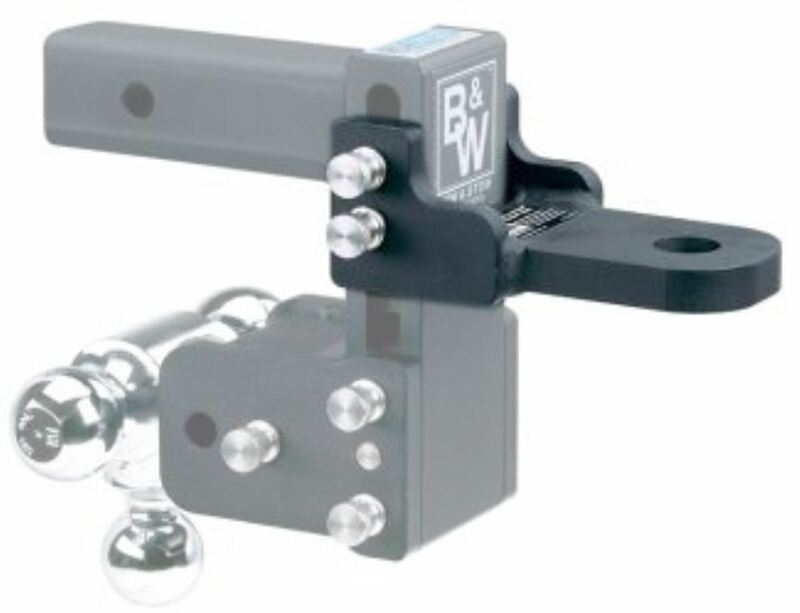 The B&W Clevis Adapter # BWTS35200B works on their 14.5K-rated 2-1/2-inch Tow & Stow ball mount # BWTS20048B. 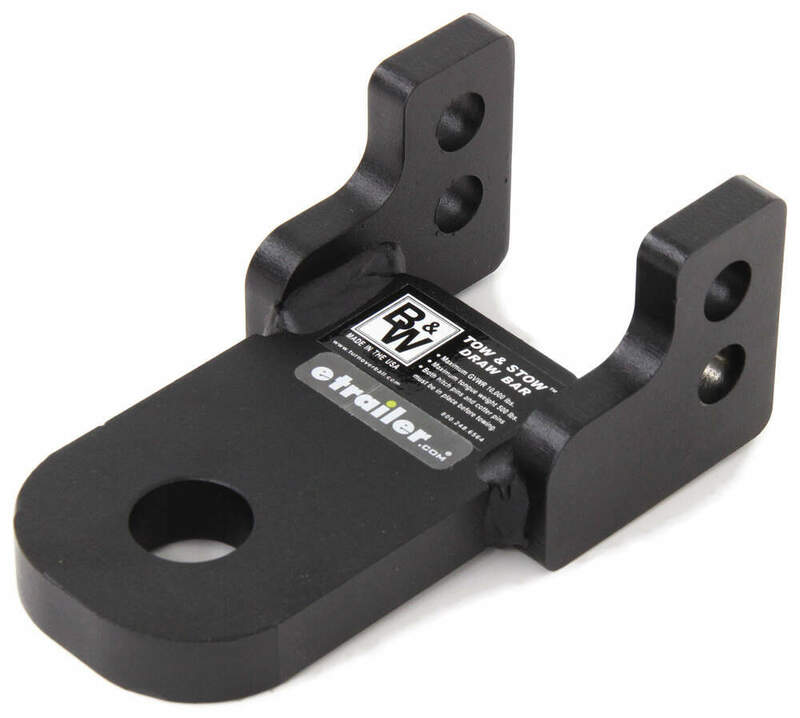 For a similar part to use on the 2-inch Tow and Stow ball mount # BWTS10037B you can use 10K-rated part # BWTS35100B which is sized and weight-rated appropriately for that ball mount. The Clevis Adapter part # BWTS35100B that you referenced can be installed on the B&W Tow & Stow 3-Ball Mount # BWTS10050B that you referenced. However, this adapter is not designed for use with a pintle setup. 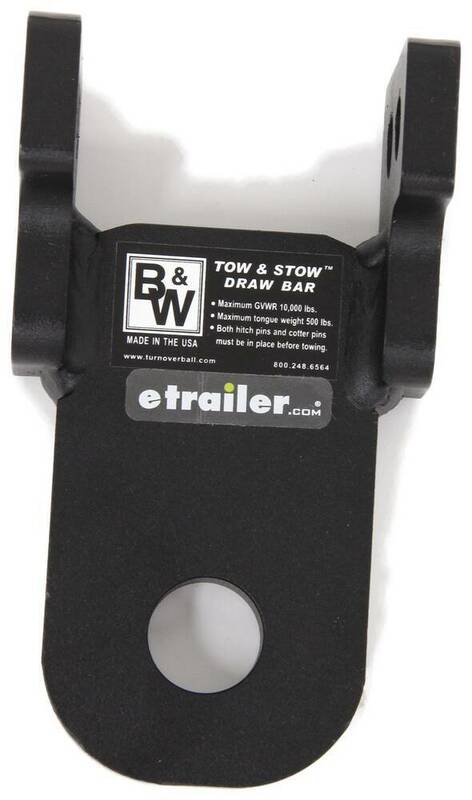 A better solution would be for you to go with the B&W Tow & Stow Pintle Hook with 2-5/16" Ball # BWTS10056 if you also need to tow a trailer with a lunette ring. Unfortunately, the Clevis Adapter for 2 inch hitch ball mounts, part # BWTS35100B, is only rated for up to 10,000 pounds. The # BWTS35200B you asked about measures approximately 2-3/4 from center on center between the mounting holes and the pins have a 1/2 inch diameter and have a usable length of about 4-1/2 inches. The diameter of the hole on the platform of the # BWTS35100B is 1-1/4 inch so a 1-7/8 inch hitch ball like the part # 63017 would fit. The Clevis Adapter for B&W Tow & Stow 2-1/2" Ball Mounts # BWTS35200B that you referenced spans the 3 holes as you can see in the first attached photo. The other photo that you are referring to (with the 2 consecutive holes) is a demonstration picture that had the Clevis Adapter for 2" Ball Mounts # BWTS35100B in it. I have attached a review video of the 2-1/2" ball mount adapter which shows how there is an extra space between the 2 pins. The overall dimensions of the Clevis Adapter for B&W Tow & Stow 2" Ball Mounts # BWTS35100B that you referenced are 5-1/2" long x 3-1/8" wide x 2-7/8" tall.